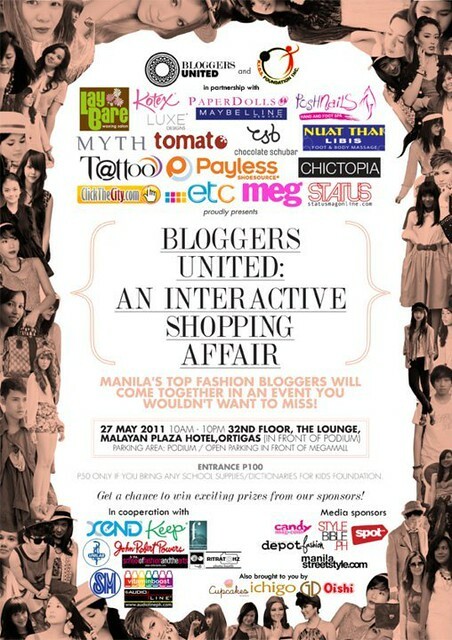 www.raleene.com: Bloggers United bazaar this FRIDAY! Oh yes, you know you just HAVE TO drop by the Malayan Plaza this Friday. You can't miss out on this event! Manila's most prominent fashion bloggers will be selling items from their closets or respective fashion lines. PLUS if you donate to our chosen charity by bringing in old books or school supplies, you can get 50% off the entrance fee! So please come to our event and support a bigger cause. "Mark the date: May 27, 2011 @ The Lounge (33rd floor), Malayan Plaza Hotel, Ortigas city. Manila's top fashion bloggers will come together in an event you wouldn't want to miss! We recognize the bloggers’ massive power to inspire, and influence the public on how they think, behave and spend. But more than that, we want to use that power in order to make an action in spreading social awareness and issues to our fellowmen." Hope to see you there! My booth with Kryz will be on the 32nd floor, right next to Camille and Laureen's! And oh, sister and I will be performing. Seriously excited for Friday even though I know I'm already stressed to the bones. Hope the turnout will be great-- there will be a part 2 this December if ever!